Twice a year we get the opportunity to get ready for General Conference Weekend and this is that week! There are ALOT of free resources to help our children to be entertained (and hopefully quiet enough that they can listen, too) while the General Conference speakers are talking. Sitting for that long can be torturous for busy bodies, but can be easily handled if you have the right tools on hand. Here are some fun ideas for you use. I’ll be updating our General Conference Pinterest Board, too, so make sure you check it out! It is fun to listen to people that you know, so help your kiddos get to know the Apostles by using these General Authority flash cards. In the September 2014 Friend they have a couple pages with 3 fun facts on the back of each about the General Authority on the front and they use a picture icon to help them remember. I used these with my 5 year old class on Sunday and was super impressed on how quickly they were able to remember the facts and which belonged to who. You can print the flash cards here. 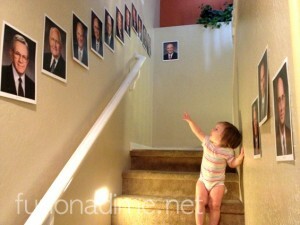 Today I am putting up our General Conference hallway “decorations” to also help connect names and faces. Make sure you click here to see how we used them growing up. This year, I think I am going to attach a fun fact or two from the above flash cards until we put up the other stuff after General Conference weekend. My kiddos love coloring pages and sketching right now, so last General Conference I made some quick “blank” canvas speakers for them to color in and get creative. You can check out the Male – Color the Speaker and Female – Color The Speaker free printables here. Here is a General Conference Packet from Sugardoodle.net that my kiddos really like the coloring pages from. In fact, between the sketching above and the coloring pages in this kit, they didn’t even have enough time to finish the entire packet. I’ll post more packets on the Pinterest board, too, to give you variety. Every kiddo is different and I am sure you will find something that will work for you. I know a lot of work goes into creating these packets and I really appreciate the time and effort creative individuals put into creating them! I love this Coloring Box idea from Berry Sweet Baby. It keeps the kiddo contained and busy. I can totally see my almost 2 year old loving this and I bet my 6 and 8 year old would like to get in on it, too. There are a lot of Quiet Activity ideas around, but I love the idea of activities that inspire quiet. There is a difference! lol For example, the General Conference Cash from Somewhat Simple. I like the idea of stopping between speakers for a quick question. With technology today, that is totally possible and should be taken advantage of. It’s a great opportunity to quickly refocus everyone in a few seconds. Another fun way to enjoy conference is to make it a game. Play Conference Bingo (like the pic below) or pick a few words like, Temple, Christ, or Love (or whatever you want to focus on) and keep track of how many times it is said during General Conference. Create a sheet on the wall or individual tally sheets. I challenged my 5 year olds in class last Sunday to try to see how many times they hear the word “Temple” throughout General Conference. I am excited to see what they come up with, even if it is only a few times they heard it. This Bingo Game is from Bits of Everything and there are a variety of other sheets on LDS.org, too. If all else fails and your child is absolutely against coloring or writing, pull out a craft bin, popsicle sticks, blocks, legos, water colors, paints and get creative and/or crafty. You can make a tower from blocks or popsicle sticks, paint rocks, make paper airplanes, teach them how to finger crochet (I’m going to have to do that soon, too! I think they could have fun with it), build Temples from Legos, etc. There are lots of ideas, once you get thinking. Remember to make it an enjoyable experience! You don’t have to go out and spend a lot of money (or time) for preparation BUT if the kiddos are happy than you, Mom and Dad, get to listen more. It’s a win, win. So, find something that will keep everyone entertained (1 thing for each session) and enjoy! Here are some more fun and creative ideas, paper banner, containers, printable and more for kids during General Conference. I have been trying to get a copy of the Ulitmate geneal conference packets, but they aren’t showing up when I click on the links provided. Is there a way to get copy? Melanie…I am sending you a private message via your email. It looks like her site is down or suspended. I am trying to reach out to her. Great news! I was able to track down the creator and she changed domains. The links are now updated!